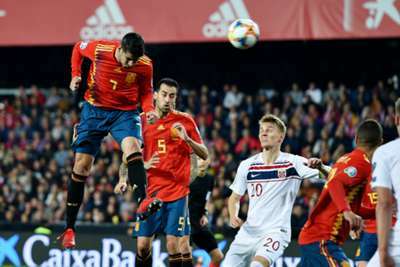 Luis Enrique dismissed suggestions Alvaro Morata is low on confidence after the Spain striker drew a blank in a 2-1 home win against Norway. Spain got their Euro 2020 qualifying campaign up and running with a victory secured thanks to Sergio Ramos scoring a penalty won by Morata. But the Atletico Madrid striker, who is on loan from Chelsea, failed to score despite having six shots - more than any other player at Mestalla on Saturday. A Dani Ceballos cross provided Morata with his best opportunity to score his first international goal since November 2017 but the striker headed off target. Luis Enrique, though, feels Morata is turning his career around after leaving Stamford Bridge to return to the Spanish capital on loan. "I see him much better than when he was at Chelsea," Luis Enrique told a news conference. "He has been always great with us but now he is more decisive, keeping the ball at the end of this match for example. "He did that with confidence. He had many chances and he was where he had to be. He wasn't lucky enough but he had a great match, his best match with us so far. "It was a complete match where we created many clear chances. We dominated Norway, who tried to attack us from set-pieces. "We knew the match was going to be like this but I am really happy for team's performance in every way. "I would like to have scored 50 per cent of our chances and we would have talked about a great result but this is football. We can improve that giving confidence to the players." Jesus Navas and Dani Parejo were among the players to shine for Spain, who continue their qualifying campaign against Malta on Tuesday. "He has been very good, he has lost a couple of balls at the beginning," Luis Enrique said of Parejo, the Valencia midfielder playing on his home ground. "But he is an ice-cold player, he is not affected by the accuracy, he is intelligent, very happy that he is with us." Of Sevilla veteran Navas, who impressed from right-back, Luis Enrique added: "It's key to have players in a squad that overflow, and Navas has been at a spectacular level. "He has not made a mistake, he has defended and attacked well, he has focused well."